Ceramic Frankenstein, delivered by Erik Kok and Rudi Bastiaans from the AKI, Academy of Art and Design, was certainly out of the ordinary. 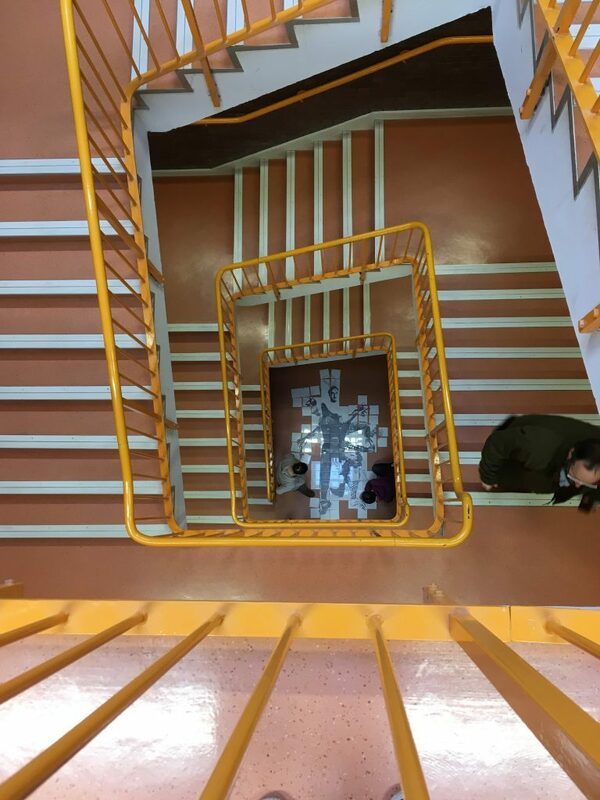 Our project lasted four days between 12th and 15th of February 2018 and consisted of approximately 30 students ranging from MA ceramics, through BA Games Design, Illustration, Fine Art, Animation, and Surface Pattern; To say that the groups and staff involved were eclectic would be an understatement. The groups were diverse and the relationships formed between students and staff were vibrant. Once the groups are assembled the first task was to begin drawing and photographing each other, taking elements of each skill set in order to start developing a ‘monster’. Some groups drew on their drafting skills, in order to create human-sized creatures purely from imagination. Others blended photography with digital elements to create creatures that held a physical resemblance to them. The second step was to start merging these drawn and digital elements together, creating large-scale positives that would eventually be exposed on to silk screens for printing. This process was lengthy and really pushed students away from the comfort zones. 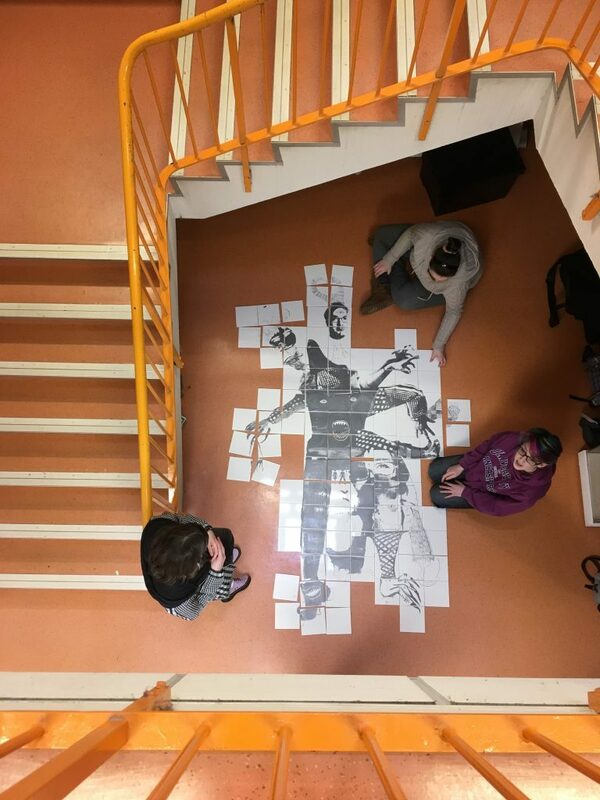 Some students found the act of taking something physical into the digital daunting, others had the opposite reaction, finding creative freedoms within the digital aspects. Overall the most challenging aspect of this process was creative collaboration. With such diverse groups of creative individuals, with such broad background finding common aesthetic and contextual goals created numerous highs and lows. I think that this is, however, the beauty of the project; and over the four days, solutions to problems were found. On the Second Day – The Printmaking Began By far the most challenging day from the four was the second day. This was due to a number of factors, the fast turn around cleaning and developing screens, the stress of only being able to pull each print once and printing without a screen bed and frame.. onto ceramic tiles.. with ceramic ‘anglais’, not screen printing ink. For this day, we decided it was easier not to use our dedicated screen-printing studio, but to transform our drawing studio into a huge group printing workstation. To do this we clamped together frames and wood in order to create one huge ‘bed’ that we could work around as a unified group. It took approximately three individuals to hold one screen in place and two individuals to pull one print. If this was not tricky enough only one pull of the on-glaze could be made; if the print was not registered or the screen not adequately prepared, corrections could not be made. On-glazeis a glaze used for colouring ceramics, it is traditionally applied by hand before firing to create a variety of hues and colours. It works by being burned in the kiln at 800 degrees c and sinks into the origional glaze on the ceramic tile. Printing with it is tricky, but ultimately satisfying with beautiful results. We prepared textiles screens in the usual way, stripping, cleaning and degreasing them before coating and drying and exposing them. Some monsters consisted of up to eight screens, meaning that the process of stripping and recoating them for a new stencil was incredibly tight. This actually turned into a great group activity with students taking on different roles and enjoying the fast turn around and collaborative effort. 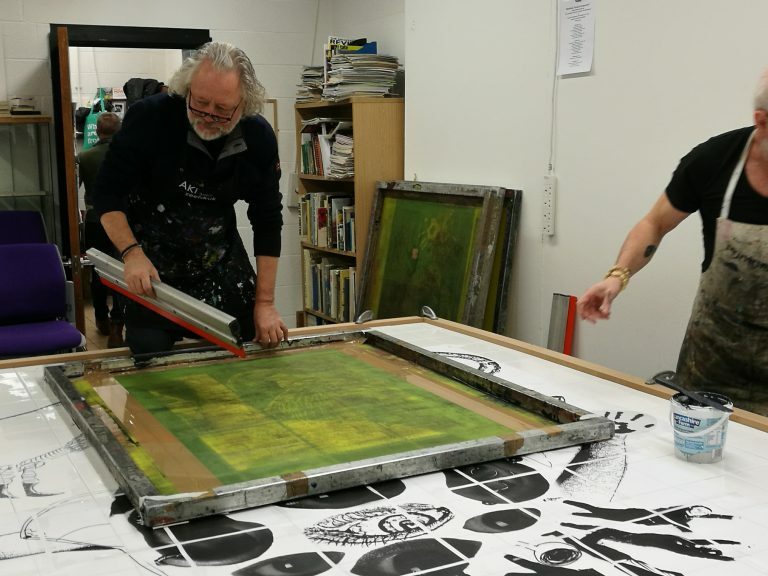 As a technician, it was great to see that students were becoming more confident in their abilities and began passing on tips and tricks learned during their electives and previous projects to students newer to the printmaking department. Over an action-packed, twelve-hour day and approximately 23 large textiles screens later, our monsters were beginning to form. The third day consisted of a lot of nail-biting, with the ceramic tiles being placed into the University of Central Lancashire’s kilns to be fired. A number of students decided to take this time to either catch up on their project work or visit Liverpool for inspiration. I, however, held the fort in the Artlab studios and dismantled the makeshift printing bed. The Presentations Day four, was perhaps the most exciting, with the students unpacking the kilns to examine their tiles. As each tile was only 20 x 20cm the outcomes were not immediately obvious. the students still needed to find a place to temporarily install each work in order to display them and meet their creations. I think that the results speak for themselves. Unique pieces of permanently printed ceramic works made by an eclectic group of individuals from the University. 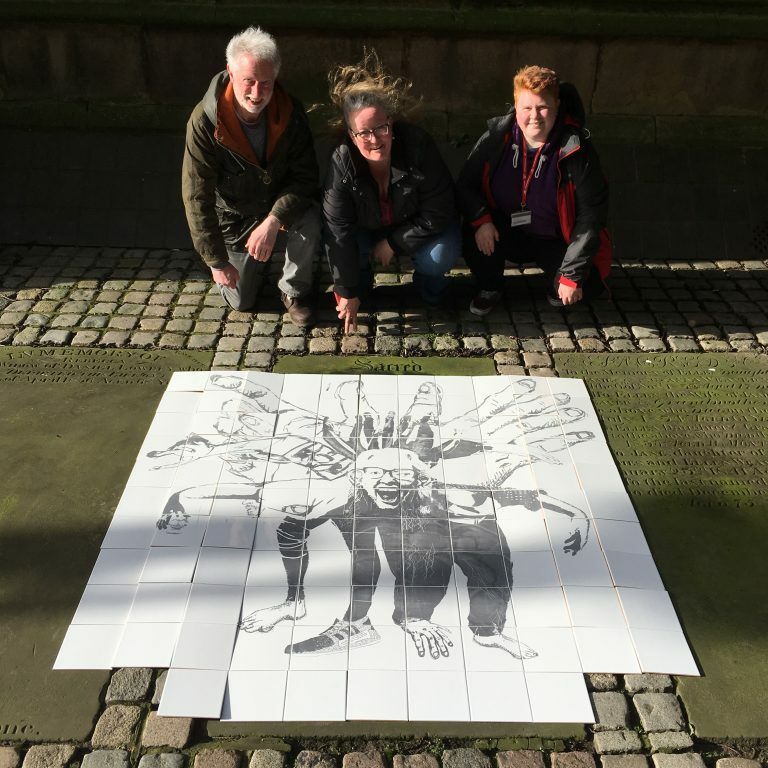 I really look forward to working with these individuals in the future and seeing the tiles installed in various locations around the University of Central Lancashire. I would like to say a huge thank you to everyone involved for a fantastic four-day workshop.